When it comes to planting acorn squash, it's best to sow the seeds directly into the garden or container. Acorn squash seedlings don't like it when their roots are disturbed. So attempting to transplant seedlings usually leads to disaster. If you live in a climate where you need to start the seedlings indoors, use bio-degradable pots that can be planted in the ground without having to remove the young seedling. 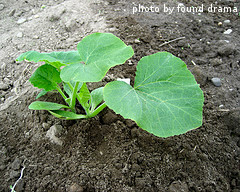 Acorn squash should be planted no earlier than 2 weeks after the last expected frost in your geographic area. They can be planted up until 12 weeks before the first expected fall frost. 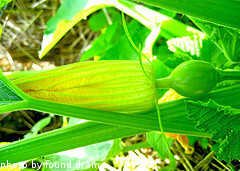 In warmer climates, it's possible to get two crops of acorn squash per year. The seeds do best when soil temperatures have warmed to 65 degrees F. Some people plant acorn squash as a second season crop after early spring plants such as peas and lettuce have finished. This can be a good way to maximize garden space. If you are planting acorn squash in a traditional vegetable garden, make sure the soil is tilled down to a depth of at least 8 inches. This will allow the roots plenty of room to develop. A few days before we want to plant, we do a light tilling, and then scatter 17-17-17 fertilizer granules over the plot at a rate of 1 pound per 100 square feet. Because our soil is a bit acidic, we also scatter some lime. We then water in the fertilizer and lime, wait a few days and till again, going as deep as we can. This gets the fertilizer and lime mixed into the soil. After the soil is well tilled, create mounds or hills about 12 inches across and 3-4 inches high. If you are planting the more common bush varieties, space the mounds 3 feet apart. This will give you plenty of room to till between the plants early in the season, aerating the soil and getting rid of weeds. For less common vining varieties, space the mounds 4 feet apart. If you intend to grow your squash organically, you can go ahead and mix some compost or well rotted manure into the soil when constructing the mounds. Remember to choose a location that gets 6-8 hours of daily direct sunlight. After the mounds are created, use your finger or the end of a hoe or trowel to poke 2 holes into the top of each mound. The holes should be about 1 inch deep. Drop a single seed into the bottom of each hole and cover it with an inch loose soil. After you've finished planting the seeds, water them in thoroughly. When the seedlings reach 2 inches tall, thin to one plant per mound. Thinning is necessary to make sure the plants aren't competing with each other for water and nutrients. If you are planting acorn squash in containers, you don't need to create mounds. 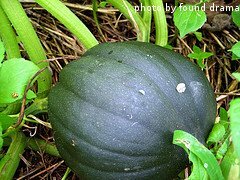 Make sure to choose a bush variety of acorn squash and a container that is at least 24 inches across and 14 inches deep. Also be sure that there are adequate drainage holes in the bottom of the container. Plant 2-3 seeds per container and thin to 1 plant per container when the seedlings reach 2 inches tall. Be sure to use good quality potting soil or top soil and water the seeds in well after planting. Remember to place the containers where they can get full sun throughout the day. Now that you're done planting acorn squash, the next step is to water and fertilize the plants.